Home » Paleontology » Fossils of Arkansas » Fossil Friday: We may have bats in the belfry, but we’re not crazy. Fossil Friday: We may have bats in the belfry, but we’re not crazy. I know this is getting posted late, sorry about that. I got an unexpected request by a local news reporter to be interviewed about a fabulous new shark fossil found in the Ozark Mountains of Arkansas. I will have to write about that soon. But that’s for later. For today, we have something very different. This week’s Mystery Monday fossil was a tough one. People are much more used to seeing them alive than as fossils. When people do see them, they usually don’t like them, which is a shame. These little guys are very misunderstood creatures and we owe them a debt of gratitude. This picture is from Arthur Harris of the UTEP Biodiversity Collections. It is a jaw from Eptesicus fuscus, the Big Brown Bat. Why a bat, you ask? Because April 17 was National Bat Appreciation Day. Most people do not appreciate bats, holding onto the myth that bats like to fly into people’s hair and give them rabies. In truth, bats do their very best to avoid people. If you weighed less than a pack of cigarettes with fragile bones, would you annoy something that outmassed you by at least 2000 times? The simple fact that bats are the only mammals that can fly is pretty cool, although perhaps less so when one considers that bats make up over 1000 of the approximately 5500 species of mammals. Nevertheless, being able to fly using hands that are each bigger than its body is appreciation-worthy. The fact that their wings are giant hands helps explain why they can fly with such aerobatic skill. We have mechanoreceptor’s in our skin called Meissner’s corpuscles, which allow us to have a well-developed sense of touch in our fingers. Bats have these in huge numbers all over their wings, using them to detect the air pressure on the wings as they fly. The wing is essentially a giant finger tip, sensory speaking. They also have tiny hairs that are very sensitive to airflow over the wings. Despite people’s antipathy towards them, bats are very valuable. Without them, we would be eaten alive by mosquitos and all manner of bugs. A little brown bat can eat up to 1000 mosquitos in one hour and a single colony of big brown bats can eat 33 million rootworms in one summer. 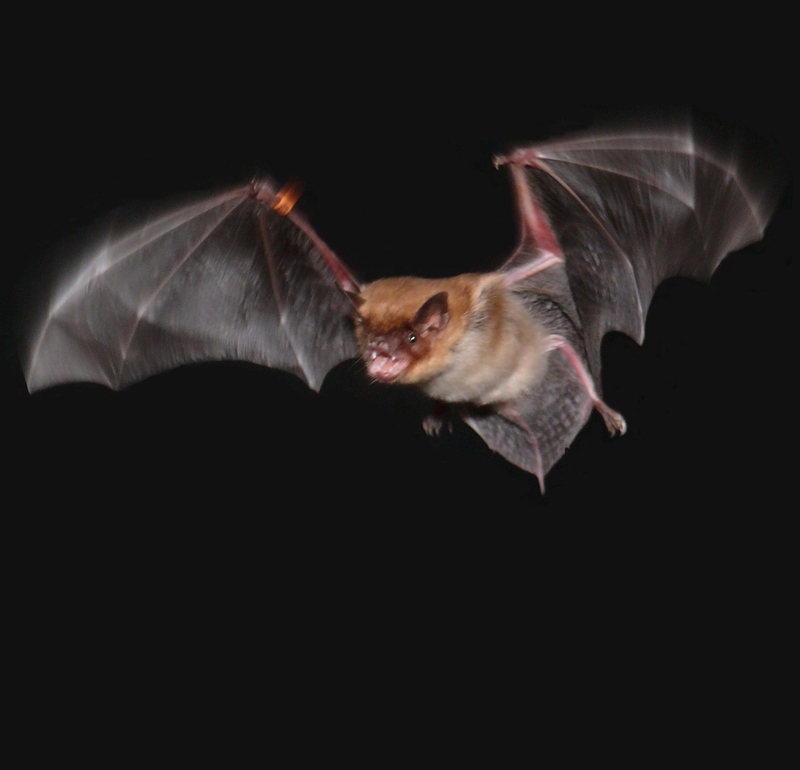 Big brown bats eat all sorts of insects and are adept at catching them in mid-flight. The spiky, ridged teeth are an adaptation to crunching the hard, chitinous covering of beetles and such types.Bat guano has been used for numerous products, everything from fertilizer, gasohol, antibiotics, and gunpowder. The big brown bat in particular seems to thrive in areas with humans, often setting up colonies on man-made structures. So if you have bats in your belfry, they are probably this type. But don’t worry, they’re helping you. Even though they are called big brown bats, they are only really big compared to the little brown bat. They attain body lengths up to 13 cm (5″), with a wingspan of a whole foot or more, which is large for a bat. Their fur ranges from tan to a dark chocolate color, with black skin, making their wings black, naturally. Basically, think of your average bat (although a bit smaller than most people’s hyperactive imaginations) and you will be thinking of Eptesicus. They have excellent hearing and can use echolocation to find their way around, although the idea that bats are blind is a complete myth, they see just fine. Because they are small and fly, they need to eat a lot. So to make up for an insatiable appetite, they sleep a lot during winter when food is scarce. A lot. Big brown bats can hibernate over 300 days, almost a whole year. Even so, they can tolerate cooler temperatures than most other bats and can come out of hibernation during winter if need be. They can live for almost 20 years, but most die within their first year. Winter is rough for bats, especially when they are small. They aren’t mature until their second or third year and only have typically only two offspring a year, so they do not have a high reproductive rate. Even if they have a low reproductive rate, their heart rate is staggering. They go from over 400 bpm at rest to well over 1000 bpm in flight. One wonders how they prevent their heart from exploding. It is often said that bats have legs with knees bending the opposite direction of other mammals. This is not really true. What they have are legs which are turned at the hip so far they look backwards. 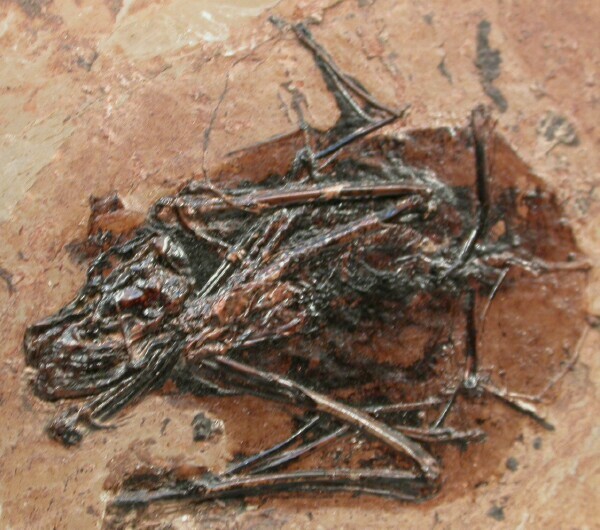 Palaeochiropteryx, a fossil bat from the Messel Shales. Fossilmuseum.net. Fossils of this animal can be found throughout the southern United States all the way down to Venezuala (Kurta and Baker 1990). The genus Eptesicus can also be found throughout Europe. No bat is very common in the fossil record, but these are the most common and widespread. They also seem to be expanding their range. The fossils are found throughout Pleistocene deposits for the past few million years. The current range goes all the way up into Alaska, from the Pacific to Atlantic coasts,and throughout the Bahamas and northern South America. if you want to find fossil bats in Arkansas, I recommend you go into the caves in the Ozark Plateau. Any place you can find modern bats living, there is a decent chance that if you dig down into the floor of the cave, you will find bat fossils. By paleoaerie in Fossils of Arkansas, Paleontology on April 18, 2014 .